alaTest has collected and analyzed 322 reviews of Dell Venue 7. The average rating for this product is 4.0/5, compared to an average rating of 4.3/5 for other products in the same category for all reviews. Views about the durability and screen are overall positive. The design and price are also appreciated. There are some mixed opinions about the usability. The apps and size get negative reviews. We analyzed user and expert ratings, product age and more factors. Compared to other products in the same category the Dell Venue 7 is awarded an overall alaScore™ of 89/100 = Very good quality. 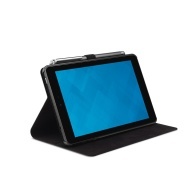 alaTest has collected and analyzed 272 user reviews of Dell Venue 7 from Amazon.com. The average user rating for this product is 4.1/5, compared to an average user rating of 4.1/5 for other products in the same category on Amazon.com. Dell's Venue 7 is an attractive tablet with good battery life, a loud speaker, and a clean, up-to-date version of Android. But performance issues and its 1GB of RAM make it hard to recommend—especially for those who want to play games. The Dell Venue 7 and 8 are refreshingly bloatware-free and start at affordable sub-$200 prices. Performance during casual use is stable and there's a microSD card expansion slot. Performance slows down when downloading app updates or large files. The thick bezels slightly outdate the tablet's design. The Dell Venue 7 is one of the best small tablet bargains. The larger Venue 8 is just as capable, however there are other 8-inch slates that offer more features for the same price. Dell's Venue 7 is an inexpensive Android tablet that is upstaged by more capable options from Amazon and Barnes & Noble. Great bargain. Loud speaker. Simple, minimal design. Poor cameras. Higher-resolution options are available in the $150 price range. Strong battery life; Bright display; Attractive textured design; Loud audio ; No physical home button ; The Dell Venue 7 is an attractive and capable 7-inch Android tablet with strong battery life. No physical home button ; The Dell Venue 7 is an attractive and capable 7-inch Android tablet with strong battery life. There are lots of Android tablets to choose from, ranging from the inexpensive to big bucks. These two tablets from Dell are light on the wallet and have a unique feature. The Dell Venue 7 Android tablet sounds like a good idea on paper, but a nice piece of hardware with a good price for a 7-inch Android tablet gets hampered by sluggish performance, even after a much-needed firmware update that improved things a little. The Dell Venue 7 is Dell's entry level budget tablet offering a huge 7 inch display with a some unique specs and features. We will be having a closer look at this beautiful device in our exclusive full in-depth hands-on Dell Venue 7 review. Dell Venue 7 is a mid-end Android tablet with a 7-inch 1280x800 pixels screen, Intel Atom Z2560 chip clocked at 1.6GHz, 2GB of RAM, 3.2-megapixel rear and VGA front cameras, and 16GB of expandable storage.